We live in Fleming Island and we love it! Highly disciplined, Margaret Seton Fleming had a working knowledge of trade, business and politics, as well as domestic subjects. In 1837, she moved to Hibernia Plantation with her new husband, Lewis Fleming, whose father George had received Fleming Island as a 1790 land grant from the king of Spain. In the years to come, she would twice witness the destruction of the plantation and twice bring it back from ashes. Her dream from the time she arrived at Hibernia as a 24-year-old bride was to have a "proper chapel" on the grounds. Construction on the church in the Carpenter Gothic style was begun in 1875 and completed in 1878. Sadly, Margaret died only months before its completion and its first service was her funeral. Fleming Island has again been rebuilt and is one of the fastest growing areas in the county. There are also many private schools and academies nearby, as well as several colleges, including St. Johns River Community College on whose campus the Thrasher Horne Center for the Arts opened in 2004. The Clay County School District has long been a top drawing card, with a ranking in the top 14 percent in the nation and test scores above national averages. Fleming Island is located near St. Augustine, FL, the oldest city in the country and is 15 miles from Jacksonville in Clay County. A master-planned community, Fleming Island is a complete hometown designed to meet the needs of residents and includes many unique communities including Fleming Island Plantation, Eagle Harbor, Hibernia Plantation and Margaret’s Walk. This charming family-oriented community is proud to offer residents an abundance of amenities and attractions. These include an assortment of water parks, soccer fields, swimming pools, golf courses and tennis courts, all of which add to the already appealing area known as Fleming Island. In addition, there are numerous public boat ramps as well as a bike trail that stretches from Doctor's Inlet to Black Creek. Local lakes and waterways provide for canoeing and fishing for the true outdoorsman. Financial and commercial areas are located within the community and there are many new restaurants, shopping centers, offices and professional buildings which eliminate the need for residents to travel into neighboring Orange Park. Fleming Island schools, like all schools in Clay County, are highly rated and provide excellent educational opportunities for students. There are several childcare centers as well as early education schools, elementary schools, 2 junior highs and a high school serve the children of Fleming Island. Acres of undisturbed nature are full of wildlife and can be easily accessed from the miles of sidewalks, bike paths and trails that weave throughout the community. If you are looking for waterfront, there are many choices; riverfront, creek front and lakefront homes and varying price ranges. Everything in Fleming Island is readily available and easily accessible, making it a convenient and comfortable place for families, retirees and professionals to call home. Fleming Island's real estate offerings include golf course homes, waterfront homes, condominiums and townhomes. Housing prices in Fleming Island range from the low $100,000s to $1.5 million. Some of these areas include Pace Island named for the Pace family that started this beautiful gated waterfront community. Located near the Village Square, schools and parks; Chatham Village; Southern Links; The Links; and River Hills Reserve, which features lake, golf or nature preserve views. Eagle Harbor's mini-neighborhoods each have their own park and playground area. Eagle Harbor Elementary School is one of three A-rated elementary schools on Fleming Island. Thunderbolt and Paterson Elementary Schools is also located here. Fine living for the active individual or family has always been the goal for Fleming Island. Community parks have volleyball, basketball and tennis courts, ball fields, and playgrounds. Fishing, picnicking, and canoeing are favorite activities at the lakes and waterways. The Golf Club at Fleming Island is a semi-private 6,800-yard track that blends with—and enhances—the natural beauty of the area. The many pools serve the needs of everyone, from the serious lap swimmer to babies learning to float. The water parks have fountains and sprays to keep everyone cool and there are miles of sidewalks, trails, and paths for walking, strolling, biking, skating, and jogging. 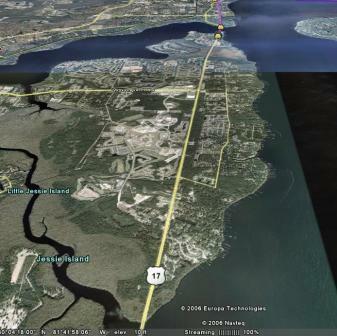 If one needs to venture outside Fleming Island, Jacksonville is nearby. The city is a busy seaport and a major financial, cultural and commercial center. There are a number of museums in Jacksonville, including the Jacksonville Historical Center with exhibits and displays describing Jacksonville’s colorful past. The Alexander Brest Museum has collections of decorative arts and pre-Colombian objects. The Jacksonville Maritime Museum commemorates the maritime trade and its impact on the area. The Museum of Southern History houses displays and exhibits from the Civil War period. Other interesting places to visit include the Jacksonville Zoological Gardens with more than 1,000 animals, and the Tree Hill Nature Center with a butterfly garden, hummingbird garden, snake exhibit, nature trails, and turtle preserve. The Anheuser-Busch Brewery has tours of the brewing and bottling areas and opportunities for tasting the fine beer made on site. Furthermore, residents of Fleming Island looking to explore some of St. Augustine’s areas of historical interest may do so by starting with the many museums focused on the early colonization of Spanish explorers. Others may choose to simply enjoy the feel of history by strolling the narrow Old World streets. Day to day life in St. Augustine makes it easy to appreciate the rich heritage that makes the community such a unique place to live. The Colonial Spanish Quarter is a living history museum. Costumed interpreters relive a time when St. Augustine was a remote outpost of the Spanish Empire. The Quarter provides a glimpse into the life of Spanish soldiers and their families in 18th century St. Augustine. Tradesmen go about their occupations in blacksmithing, carpentry, leatherworking, candle making and other trades. The area has many organized activities for people of all ages. There is an active 55-plus group. a number of championship-quality golf courses, organized tennis and soccer and all types of programs for children. Call or email me for your FREE Relocation Package today-904-334-7425. We live in Fleming Island we have the scoop! Fleming Island has to offer!